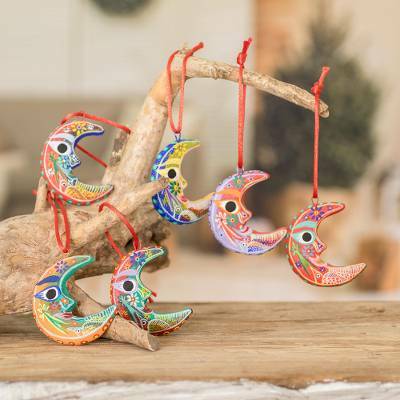 Handcrafted Christmas Ceramic Ornaments (Set of 6), "Crescent Moon"
Shaped of terracotta and painted by hand, the crescent moon has a cheerful smile. Jose Arriola creates a set of six ornaments with the colors of Guatemala. Birds, flowers and a Christmas star adorn the ornaments. They arrive in a colorful storage pouch made from handloomed cotton. You can find ceramic ornaments 'Crescent Moon' (set of 6) by Jose Arriola in holiday decor & ornaments categories such as Christmas Ornaments and Sun and Moon Ornaments. Enjoy exploring these sections for other Novica treasures. Jose creates the most beautiful ceramic ornaments and figurines. His family has lived in Antigua for more than 100 years and he takes great pride in practicing the same ceramic techniques his ancestors used. He wishes to help this tradition continue and he teaches anyone in his community who has an interest in learning. Jose Arriola has received 7 microcredit loans with 0% interest from Kiva and Novica, the first for $450 and the most recent for $2550. Proceeds were used to purchase paints and materials for his ceramics to continue production. Jose's beautiful work and his preservation of cultural techniques have brought him recognition in national exhibitions, and his municipality even created a video showing the process of how he creates his figurines. Jose's children are all grown but but he does provide financial support for the education of one person outside of his family and he occasionally supports other children's school expenses. Jose has been dealing with diabetes for over 17 years. His condition has caused many problems for him, but currently he is able to control it and enjoy his life. Jose provides employment to several people within his community. Several universities have recognized Jose for his work. Gorgeous ornaments. Every detail, color. Lots of love in this work. Love it! While I got these to sell as Christmas ornaments, they are suitable for any time of year. Lovely intricate designs! "Hang them all year round"
These are beautifully painted, so much detail - tiny detail! I'm hanging these and my painted stars all year round - not just for the Christmas tree. I bought these to split up as holiday gifts. They are so beautifully crafted. Nice detailing and work. "Don't ask me how, but we never lacked food on our table – we could be lacking in many things during the Civil War, but we never lacked food." "My full name is Jose Antonio Arriola Rodenas and I come from a happy family that has lived in Antigua for more than 100 years! My grandparents lived with us, as well as two uncles from my mother's side with their families. My dad was a master carver and he was known for his relief work. His work has been awarded by the government and it graces Guatemala's National Palace as well as the U.S. Embassy. On my mother's side, five generations have been dedicated to the beautiful craft of ceramic arts. "That meant that at home we had two workshops – my father's where he worked with one assistant, and my mother's where they specialized in ceramics. Dad's workshop was too serious and somber for me, whereas everyone seemed to be having fun at my mom's. That's how I first got into ceramics, to have fun! "I spent my school holidays there and learnt the craft. My siblings and I would receive some pocket money for us to buy whatever we pleased, and I used to spend it on fireworks and sweets. The first things we were taught to make were animal figurines. "The traditional arts and crafts of Guatemala have had many ups and downs. We went through bad times when we worked hard and barely earned anything. During the Civil War (1977 – 1984) tourism was low and we could hardly sell a thing. However, we managed to pull through as a family. Don't ask me how, but we never lacked food on our table – we could be lacking in many things during the Civil War, but we never lacked food. "I studied up to the second year in university but dropped out in 1979 when I got married, as I had to get a job to provide for my family. My first job, as an adult, was at my mother's workshop, where I learned all that I could and earned enough wages for my new family. There was a boom in tourism in 1986 and, thanks to the foreigners interested in my work, I earned enough to pay up all of my debts (there were quite a few!) and I even managed to build my own home, where I also built my own workshop. I think God has always blessed me and now I'm doing well. "I like saying that I've always worked with clay, even when I was in my mother's womb because I have always been surrounded by ceramics – they are a part of my life and education. Now, after all this time, I am happy to teach others who become my apprentices and are interested in ceramic arts, since my children are not. They have seen me suffer and have lived through the ups and downs so they would rather follow a different path. "I consider myself to be timely, honest and creative, and these are the qualities that I look for when I recruit apprentices and assistant ceramists. I love my craft, the whole process is beautiful, from acquiring the clay to the finishing touches on a piece. "I am inspired by my country: the tranquil life of my city, our extensive culture, the colors, the designs on our traditional costumes, the flora and fauna. I consider it a privilege to have been born in Guatemala. "My favorite thing to do is to create new designs and I love the challenge of crafting them. Every piece is crafted and painted by hand, and each design is proof of the richness of our culture. "Working with ceramics has brought me many beautiful things, from learning the craft from my mother and uncles to providing for my family so that my four children can go to the university. I already have a grandchild and my wish for all of them is that are independent people with a career of their choice. That they be responsible and be respectful of God. "I also enjoy tending to my garden and carving, which I learned from my dad. God touched my life many years ago and helped me overcome my problem with drinking through the help of the Catholic Church. Nowadays I try to help people that may need it and I volunteer at a maximum security prison, teaching the word of God. 'It is difficult to make Light present in the darkness.'" We are very delighted with the whimsical birds which now hang on our Christmas tree. They are brightly colored and well detailed. Love the toucan! I purchased star ornaments for my best friend for Christmas. She, her husband, and each of her children were able to pick a star for their own. They loved it! Absolutely beautiful ceramics. The colours are breathtaking. They have given a glow to my home. I could still smell the workshop as I unwrapped them. Gorgeous. I haved long searched for a perfect Sun/ Moon to help me sleep. Thank you for sharing your work Jose. Ordered on a Sunday evening and arrived on Thurday morning in the UK. Incredible service.